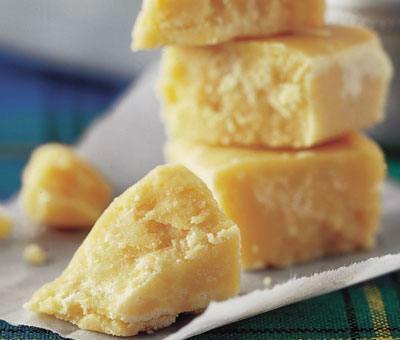 A Scottish favourite: crumbly, buttery fudge made with creamy condensed milk. 1. In a large non-stick pan, melt the butter with the milk. Slowly add the sugar and boil briskly for 4 minutes. 2. Gradually stir in the condensed milk making sure that it doesn’t stick to the bottom of the pan. Bring back to the boil and boil for approximately 20 minutes, stirring regularly, until the mixture is thick and a honey caramel colour. Take care while the mixture boils and during stirring as the tablet will be VERY hot! 3. Remove the pan from the heat and beat until set. Pour into the tin and leave to set fully then remove from the tin and cut into squares. How long will this tablet keep (out of fridge) ? Hi David, we would suggest keeping the tablet in an airtight box in a cool dry place (no need to refrigerate!). It should keep fine for about 3 weeks. Made this yesterday and left in fridge overnight but it hasn't set yet. Could this be because I used your light condensed milk, or something else? Hello Colin, Light condensed milk should work fine with this recipe. The secret to tablet is to ensure you cook it for long enough. As different hobs have different strengths this may be longer than you think. The key is to ensure you reach soft-ball stage. (Drop a little mixture into a bowl of cold water, it should form a soft mixture at the bottom) This will help your delicious tablet set in future. I have a recipe that lists 1 tin carnation evaporated milk and a tin of condensed milk,plus 1kg of castor sugar and 250g butter! I think that it may not be correct. I don't understand the difference between tablet and fudge.can you help me? Hi Carole, our tablet recipe is made from Carnation Condensed Milk. This product has a high sugar content which Carnation Evaporated Milk is missing. We do have an archive of recipes; if you would like to find an older recipe then please send an email to our consumer services team and we will try to track it down. In terms of comparison, Milk Tablet has a slightly more brittle, grainy texture, whereas fudge I generally softer. Hello Laura, 1000 grams make 1 kg. This conversion should help when using your scales. Tablet not set having followed the instructions to the letter. Help. Hello Kathryn, there are two very important stages to making tablet the boiling and the beating. Make sure you boil the fudge to 118C (soft ball stage) and then beat with a spoon until the mixture becomes creamy and begins to thicken. An electric mixer will make the beating easier. Tried this recipe and was absolutely delighted. Lovely and crumbly. Would it be possible to add nuts, raisins and flavourings such as alcohol? Hello Iyetunde, milk tablet is a true classic! These twists sound delicious. The nuts will be best toasted and should be added during the stirring step along with any dried fruit. Add any alcohol with the rest of the ingredients in step 1. Make this a lot it always turns out great , for extra special tablet I add a tee spoon of vanilla extract . Hi Dianne, vanilla adds a lovely twist to this classic treat! Hello Patricia, we love to hear of Carnation successes! Should the tablet be a bit crumbly? Tastes great, but breaks a little when it's cut. Hello Judith, sounds like you've got the recipe just right! Yes tablet is more crumbly than fudge but just as delicious. I am making this for the first time but while it is cooking for the 20 minutes I am realising I can't stir it occasionally as it is burning on the bottom. My electric hob goes up to number 6 and it is bubbling on number 1 and 2 setting. Hello Sarah, all appliances vary. If you find the tablet is sticking then keeping stirring until the tablet has reached 116C. This will prevent it from burning. how long does this last once made?? Hi Judy, we would suggest keeping the tablet in an airtight box in a cool dry place (no need to refrigerate!). It should keep fine for about 3 weeks. Though it never lasts that long in the Carnation Kitchen! I love this recipe always tastes AMAZING and never lasts long in my household. The trick is to make sure the sugar has fully dissolved before adding the condensed milk sometimes iv had to add a little extra milk to get it to dissolve properly but think I had been over heating it while adding the auger and that is why? Still tastes amazing tho. Make sure you beat it well or it turns out a bit like fudge in the middle again tho it still tastes amazing! It tastes really nice! I was a bit eager though and burnt my tongue! Great recipe the grandsons love it! my 1st ever time makin tablet and it turned out perfect.. so pleased :-) will defo be makin more! I made this yesterday, it turned out perfectly and was delicious, emphasis on the "was" as my family agreed and now its all gone so ive been ordered to make more! Such an easy recipe with great results. I always use this recipe and it's a huge hit! Hi this is a good recipe, but I use less milk and about 2oz of butter. I find that if you take you're time to ensure that the sugar has completely melted before you bring to the boil it ends up with a far better texture. I tried making this tablet but as I was pouring it into the tray it all foamed up and spread everywhere with very little left in tray, any ideas as to why this would happen? Hi Lorraine, your tablet will be very hot when it is finished cooking. When it comes into contact with a cook surface it mat bubble especially if the surface is damp. Next time let it cool for a minute before pouring into the tray. Made tablet for the first time last week and it turned out perfectly. Totally delicious! My friends and family loved it and are asking for more! Hi Pamela, there are 2 very important stages to get right when making tablet- the heating and the beating! The tablet mixture needs to get hot enough to set (about 116C) and then you need to beat it until it starts to go grainy and very thick. If your arm gets tired get some hired muscle! Or tip the mixture into a bowl and beat with an electric hand mixer - soak the beaters in boiling water after. My Husband makes tablet, but uses unsalted butter. Also sometimes it comes out soft like fudge and other times it's crumbly like it's supposed to be. Is it to do with the height of the gas flame under the pot. It all tastes delicious and is made the same as your recipe. Hi Christine, the recipe will work well with both salted and unsalted butter. The variation is texture will be connected with temperature and beating. The tablet mixture needs to get hot enough to set (about 116C) and then you need to beat it until it starts to go grainy and very thick. If the fudge comes out gritty, but has set, you can simply put it back in the (clean) pot ans re melt it. voila, 2nd chance perfecr tablet!! definitely the easiest recipe for tablet I have ever found.....got it just right FIRST time!! thanks guys. Very very scrummy!!! Made this for the first time yesterday and must say is absolutely delicious and a big hit with all my family so much so I've been asked to make it for them too,thanks for a great recipe. Hi Oonz, the fudge mixture needs to get hot enough to set (about 116C) and then you need to beat it until it starts to go grainy and very thick. It sounds as if your hob was a bit too hot, it should be just hot enough that it is boiling rapidly and it is important to stir constantly. If your arm gets tired get some hired muscle! Hi Jen, the longer you cook the mixture the harder it will set. Once the mixture hits 116C remove it from the heat and pour into the tray. Carole in Portugal have been searching for this recipe for ages, my husbands Dad was Scottish and used to make for the family. Am very pleased with the result, will be popping some, but not all, in little fancy bags for gifts for Xmas. Hi could I use clover instead of butter. HI Madge, we recommend using butter as it gives great flavour and better consistency. Many of the buttery style spreads will work in this recipe. I have trouble cutting tablet into neat squares, any tips please? I've tried an oiled knife. Should i mark it when hot or leave till completely cold? Hi Liz, once the tablets set it is tricky. As it begins to set mark it into an appropriate size and then it will be easy to separate once cooled. We have a happy house today, just made this tablet with my boys while there on school hols. Boys shouting this is the best tablet ever, it's epic!!!! Hi Sabrina, we love salted caramel at the moment! So glad you enjoyed it! I just made this tablet for my Dad's birthday and it came out perfectly, all crumbly and lovely....but my little girl and I have managed to eat most of it! I'm going to make another batch tonight and wrap it up straight away!! Hi Becky, we find this is a common problem! It's why we always have to make extra! If I use a thermometer what temperature should it be and what when do I test the temp? Hi Tammy, soft ball stage is what you're after. This is at 118C, you'll see a change in the mixture with the bubbles getting bigger as it heats up. This is when you want to start taking the temperature. Otherwise try dropping the mixture into bowl of cold water. Enjoy! Hi Barnes, light condensed milk will work as a substitute however make sure that you cook it to 116C before beating to ensure it sets. Made this last night using my new Maslin pan, it turned out lovely! I found it only took about 10 mins stirring all the time, tastes just like a tablet should do! Will be making more at Christmas. I have made two batches of this in the last few days and it is delicious! I was super careful to add the sugar gradually and ensure each addition was fully melted before adding any more. I used a heat diffuser when boiling and stirred it almost constantly. I found using my electric hand whisk at the beating stage made it really easy and also used a square silicone cake pan which worked really well too. Recipe is brillant and was easy to follow. Just need to stop eating it now - impossible! WHAT HAS GONE WRONG??? My attempt has ended in a lump of brown goo with horrible black/brown lumps burnt and solidified to the bottom of the pan. Help. Hi Louise, it sounds like the mixture has cooked for too long. If you have a food safe thermometer at home use this to make sure it reaches 116C before taking off and beating, stir all the time. If you notice it catching or colouring place in a new pan and continue cooking. My son is holding a Coffee Afternoon as a fundraising event in September. How long will tablet keep if he makes it in advance? Hi Ashley we would suggest keeping the tablets in an airtight box in a cool dry place (no need to refrigerate!). They should keep fine for about 3 weeks. I have been making this tablet for years now and in the past I have had a few disasters. And it took more than a few attempts to master this rather tricky sweet. first of all, Carnation needs to change their semi skimmed...to full fat, whole totally fresh milk..lets face it no worries about the waste with this recipe. Also you need to add 4 ounzes of butter, good quality salted. What ever you do don't through the whole bag of sugar in! Add milk butter and sugar together into a large good quality saucepan, turn heat to 1 or 2 max, the secret to this recipe is patience. and let the butter melt very slowly occasionally stirring while it does so, gradually over the space of 3hrs..yes this long.... the mixture will start to bubble away and turn slightly from a pale milky colour to something more golden... now you can add the carnation milk and turn heat up to four.... now you need to keep stirring this mix and if it starts to burn the pan, don't worry it will just give it an even nicer richer caramelised flavour, keep stirring and you may need to be it carefully with a whish... as it boils it will darken and become harder to sir until you run the spoon along the bottom of the pan the mixture will be delayed in returning so you can see the bottom of the pan, its nearly there now.... now as you stir you will see tiny bubbles appearing on the side of the pan as if the mixture is coming away from the sides...now its ready and take itand pour straight into the tray. If for any reason it doesn't set and is more like toffee put it back in the pan and heat it up again. hope this helps. I have found that no two batches are ever the same! Hi Amy, the tablet should be similar to fudge only crumblier. If it has gone hard and toffee-like it has probably reached too high a temperature when cooked. Next time you try it cook it till it starts to thicken and turns caramel brown. I have made this recipe before and I normally use less sugar which works for me. Tonight I tried it using half butter, half coconut oil and used almond milk and 500g organic golden caster sugar, it set faster than any previous tries and has a slight hint of coconut and a bit more treacly because of the molasses content of the golden sugar. Nice but prefer using just butter and probably a more refined white sugar. Hi Donna, sounds like an interesting twist on a real favourite. Hi! Just made this for the first time and it worked perfectly. An important point that is not made clear in the recipe is NOT to stir the butter, milk and sugar stage. Let the sugar dissolve without stirring. Stirring at this stage results in a gritty tablet. I was taught this by my mum - who is an expert tablet maker! When you add the condensed milk, feel free to stir. Then once it has reached the soft ball stage (116C on a sugar thermometer or when it sets if you drop a small amount it into some cold water if you have no thermometer) take off the heat and beat with every last breath in your body! As soon as it starts to get stiff and wants to set, get it into the tin. Hi Lisa, mum's always know the best tricks! Hi Elizabeth condensed milk works a treat! The weight of the carntation tins are 397g. Enjoy and let us know how it goes! Hi Jane, sorry to hear your tablet is misbehaving... Sounds like you might have got a few grains of sugar in the mixture which were not melted in the first stage. This has to be done really thoroughly to ensure you get the right end result. However tablet is more grainy and crumbly in texture than fudge - so perhaps better to follow our ultimate fudge recipe instead? Many congratulations to your son on his upcoming wedding! Tried twice now with no luck. . .both times everything seems fine untill i take it off the heat and beat it, it turns into a big brain and sets really quickly in the pan so i cant pour it out and its full of air holes. HELP! Hi Lee, we wonder if it might be getting too hot - did you use a thermometer? Let it cool a little before you beat it - then beat gently until the mixture thickens. i have made this recipe many times in the past but on recent occassions i cannot get it to set. Made it again tonight and i have a soft fudge instead of tablet and i cannot understand it, tastes lovely but wrong consistency. How odd Clare, sounds like you are semi professional at this recipe already! Did you test the temperature? Did you beat it until it turned thick and grainy towards the end? These factors should be the main reason why the texture would be different. Best of luck with the next batch! Second failed attempt! After first one when the tablet didn't set (tasted fine though), I went out and bought a large Maslin pan and a sugar thermometer. This time the mixture started to burn as soon as it got over 110C, even though I was stirring all the time. The bottom of the pan was black. How do I get it hot enough to set but not so hot that it burns? Hi Hilary, was the pan non-stick? The only thing we can suggest is use a non-stick pan, keep stirring and gradually build the heat until it reaches temperature. So sorry its misbehaving - hope you can find a solution! Maybe this is sacrilege but I plan to try adding cocoa to make a chocolate version. If you have any suggestions for me I'd love to hear them. Thank you! Hi Anne, we'd be intruiged to know what the cocoa would be like in this recipe - let the purists sneer we think it sounds delish! Our advice is to add it when melting the other ingredients. Or you could add melted chocolate instead at the end of the beating stage when its starting to set. Let us know how you get on!!! After many attempts at tablet I finally made two successful batches of tablet thanks to this recipe try it it works !!!! Well done Fiona! 2 batches eh? You'll be popular! Hi Fazla, there are 3 different types of milk - whole (full fat), semi skimmed (half fat) and skimmed (lower fat). You can use whichever you like for this recipe - but we tend to use semi skimmed as it is the most commonly consumed in the UK. I have made this loads of times recently, but the last five times I have made it it won't set hard. Could the outside temp have anything to do with it as we are in the middle of a hot hot summer? Hi Natasha - can we come and stay?! Its pretty chilly where we are! We don't think the hot temperature will make a difference to the initial setting - have you checked the temperature of the mixture with a thermometer? This is usually what can guarantee setting. Aim for about 116C. However probably best to store in the fridge once made. Best of luck! I want to make this but I only have whole milk.. will that do or will I have to go and buy some Semi-skimmed? , Hi Rachael, we haven't tried this in the Carnation Kitchen but I'm sure the whole milk will still work. I have just made this recipe for the 3rd time, this time I didn't cook it as long and used a sugar thermometer - but it seems much more grainy than the other batches in spite of me adding the sugar slowly and boiling if for the full 4 mins.. I find that boiling for a further 20 mins is much too long - I reckon 11 mins is all it needs. , Hi Jane, there are 2 very important stages to get right when making tablet - the heating and the beating! The tablet mixture needs to get hot enough to set (about 116C) and then you need to beat it until it starts to go grainy and very thick. We find some have their own preferences and twists to our recipes which is great. Hi Lorraine, we tend to stick to using condensed milk in this recipe and we haven't tested this in the Carnation kitchen. I have just made this for the second time, and its not worked out as great as the first time, it set really quickly without the 20 mins boiling, and I only beat for about 4-5 mins, and before I could get it into the pan, it had stuck and set in the saucepan! I managed to get it out, but its all bits.. I am sure it still tastes great though! But what did I do wrong? Hi Francesca, sounds like it might have got a little too hot. If you're a fudge or tablet fan best to get yourself a sugar thermometer then you can be sure it reaches the right temperature. Glad it still tastes great - sure it will be perfect again next time! I am waiting till the weekend before christmas to make mine. I made this and the peppermint creams last year for family and friends as i was unemployed and skint. Turned out to be the best presents ever, so will be doing same again this year. Going to try the fudge as well. Hi June! What a lovely idea! Happy cooking and Happy Christmas! I have just made this recipe - it is perfect. I have made a lot of tablet in my love and cannot believe I have found one that was so easy and it worked perfectly - and on the plus, it is not sickly sweet. I will be saving this recipe and using it forever. obviously didn't get the 'heating and beating' right on this one -no set! can i melt it down and reheat and beat again? Hi Denise, yes you can - do this very gently in a non-stick pan for the melting and re-heating (helps if you have a sugar thermometer). Good luck! This was my first attempt at tablet. It tastes sooo nice but I don't think I stirred it enough whilst it cooled cos it's really soft. I just made this and it is perfect. I used less sugar though, just 650g and stirred continuously. It didn't burn or boil to the top either, though I used a 7ltr cast iron casserole. It tastes delicious and is pale and creamy, the way I like it...I grew up in Scotland and this is one of the Scottish foods I will always like, and aren't so available elsewhere...yet. Perfect tablet first time but I did use a sugar thermometer which was only £3.99 and is shaped like a pen and clips to the side of the pan. Only question is (if it isn't all eaten today) how long will it keep? Hi Caroline, we would suggest keeping the fudge in an airtight box it should keep fine for about 3 weeks. Though it never lasts that long in the Carnation Kitchen! Made this today, perfection, the best tablet recipe and very easy to make. Can anyone tell me how long it will keep for? Hi Linda, we would suggest keeping the tablet in an airtight box it should keep fine for about 3 weeks. Though it never lasts that long in the Carnation Kitchen! My first time making but didn't seem to thicken and I left it on for 30 mins and bet it for 10.... Good exercise for the flabby arms... Waiting for it to set so will see what happens!!!! Hi Dorothy, so whats the verdict? I made this for the first time yesterday, it was really easy and tasted delicious! One tip, use a really big saucepan as it can boil over suddenly, as I found out, and it is extremely hot and I got a nasty burn on my finger. Hi Susan, so glad you liked the tablet – but do hope your finger is ok?! We do suggest a large pan but have now added an extra bit of guidance so hopefully others will take extra care when the mixture boils. Thanks for your comment. I made the tablet today ..just waiting for it to set ..very easy to make ..i have tried others with out success ..fingers crossed . Hi Carol, so how was it? We'd love to know! Hi everyone. I've made this the same way for years so here are some tips. Constant stirring/scraping is a must to prevent burning. DON'T use 1kg of sugar use 900g, it really makes a difference. If you can resist the urge to eat it straight away it will be MUCH more delicious after 24 hours. I find it much less grainy and the flavour develops with time. I used this recipe to make my very first attempt at tablet. It turned out awesome! Going to be making more! Hi Hazel! Yipee for homemade - great for Christmas presents too! Oops did we mention Christmas already?! Complete disaster. At step 2 my tablet had turned into a black burnt mess long before the 20 minutes were up. My pan and wooden spoon will never be the same again! I've had a few tablet disasters in my time, but have found one vital piece of information that will help! Always use cane sugar and don't use sugar obtained from sugar beet. Then your tablet will work! Hi Catherine, there are 2 very important stages to get right when making tablet - the heating and the beating! The tablet mixture needs to get hot enought to set (about 116C) and then you need to beat it until it starts to go grainy and very thick. If your arm gets tired get some hired muscle! Or tip the mixture into a bowl and beat with an electric hand mixer - soak the beaters in boiling water after. Milk Tablet is rated 4.1 out of 5 by 22. Rated 5 out of 5 by Lesley from ‘Go to’ recipe for tablet... I make this tablet on a regular basis for a charity group that I run for people with dementia. I find the recipe easy to follow and always gives me a product that I can bag and sell for funds. I always get compliments on the taste and consistency and although I have tried other recipes, but always come back to this recipe. Every batch can come out slightly different - but key is ensuring sugar is completely melted, before boiling or it will be too grainy; boiling until it reaches a rolling boil or it won’t set; and mixing it until it goes cloudy or it won’t have the right texture. Rated 4 out of 5 by Mad Mal from Easy to do Tablet Used this recipe as I was having difficulty with some others. I made a couple of adjustments: 1. Boiled all ingredients to 118 C using s sugar thermometer before taking off the heat. 2. Added 2 teaspoons of good vanilla essence once off the heat. It tastes great. Rated 3 out of 5 by Tessa from Delicious when recipe works! The first time I made this tablet it worked out beautifully. Crumbly and delicious. The 2nd and 3rd time it was a disaster. I made it EXACTLY the same but the caster sugar would NOT dissolve, even though I added it a tablespoon at a time on a gentle heat. Then I did a rolling boil for 4 minutes and 20 minutes gentle boil as per the recipe, and it still stayed very gritty. It was the right colour but not smooth. I ended up throwing away two lots, then I made it with icing sugar and skimmed milk, (had run out of semi-skimmed after all these attempts! ), and it worked perfectly. Rated 5 out of 5 by The wee one from Habbitual Tablet This recipe is so easy,I used an ordinary pan on an induction hob, heat no higher than 7 when boiling lowered to 5 without singeing.The key words to follow are SLOWLY,STIR and GRADUALLY,I also added 2 teaspoons of Vanilla essence when tablet was ready, excellent tablet. Rated 5 out of 5 by Miff from Best recipe on the net! Thanks your recipe on the left compared to another person's to the right! Also will go to your page from now on! It's delicious... .my top tip patience! Get the sugar dissolved slowly at the start and keep stirring!! Rated 5 out of 5 by Jad200777 from I only ever use this recipe! I love this recipe over time I learnt the most important thing to do is make sure to add the sugar slowly and make sure it dissolves completely before boiling initially and to never leave it alone for too long! My Scottish dad loves it for Christmas and birthdays.